Catching up on my reading and writing after being away is always a task. Between emails, regular post, getting back to the books on my beside table, a publisher waiting for work and keeping blogs updated I feel the need to be organized more than ever, and that mini-holiday feels like it lasted 10 minutes. We have started a nice routine in the morning, taking the time to have breakfast together and really enjoying the start of the day. This morning was one of those mornings and the first opportunity to try Siren Bakery granola. 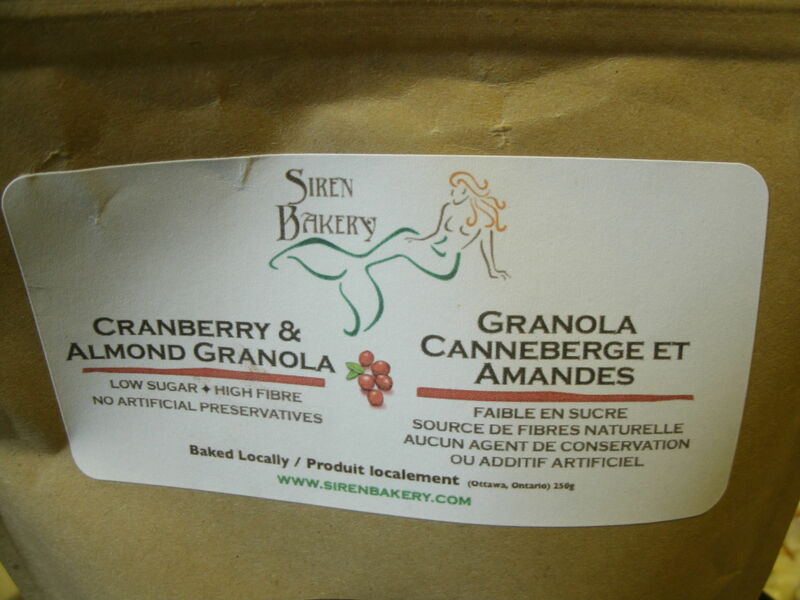 Siren Bakery is a new Ottawa based bakery that creates high-fibre, low-sugar delicious baked goods, which include 3 flavours of gourmet granola, cranberry/almond, blueberry/pecan and date/walnut. I am partial to the cranberry/almond which includes, dried cranberries, crunchy pecans, rolled oats, coconut, currants, sunflower seeds, lightly sweetened with honey. 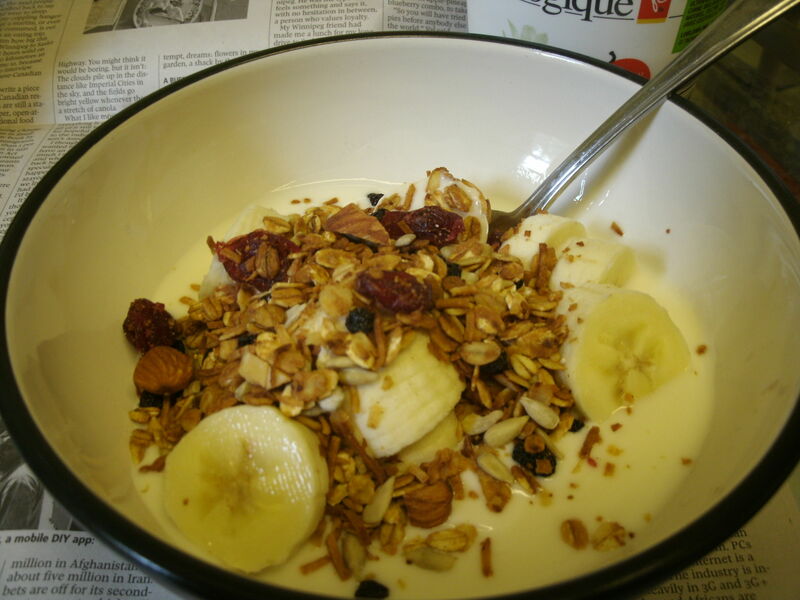 This is no wimpy granola, it stays crunchy in yogurt and it’s nutty flavour is nicely matched with the dried fruit. They stand well on their own, a perfect combination I would say. It was a lovely addition to Ian Brown’s 4th Week of culinary adventures…..
Siren was started by Loreli Lees an all natural baker and self-anointed domestic diva, who obviously cares what people are fueling their bodies with. This stuff is the real thing, good for you and taste good too! Siren Bakery is also a Bronze and Hospitality Sponsor of the 2010 Ottawa Folk Festival. They will be serving their gourmet granola to all festival volunteers, artists and musicians. How cool is that? They will also have a booth in the Food Fair. My advice, stop by and do yourself a favour by purchasing a bag! If you don’t already, take the time to enjoy your mornings, it makes the rest of the day awesome!